I am an artist, based just south of Perth, Western Australia. My paintings are mostly in a broadly realist style and, with some exceptions, are almost exclusively done in oils. Landscape paintings are of places I have actually visited and been personally inspired by. I enjoy the exhilaration and challenge of painting on location, en plein air, and can sometimes be found in the early hours out in the bush, or by the side of the road trying to capture some of the best light of the day. Portraits are painted in direct sittings with the subject (with backup photographs for reference). I have a strong aversion to the current widespread trend of using projectors. However quick, accurate or detailed the result, in my view it reduces the artist to little more than a copier and the painting to little more than a tracing. I think it is better that you learn to see and feel and understand for yourself and that doing so is important for development as an artist and as a person. I also believe in the importance, for skill development, of copying some of the great paintings of the old masters. Some of my renditions can be seen on the “Reproductions” page. I have been honoured to win the President’s Prize at the MCAA Art Awards two years running (2014 and 2015) – the first year for a landscape, the second for a portrait. And in 2017, the Curator’s Pick award, this time for a self portrait. I offer private tuition in oil painting on a one-to-one basis, either at my studio or in the student’s home. Rates are $50 per hour, in two-hour blocks. 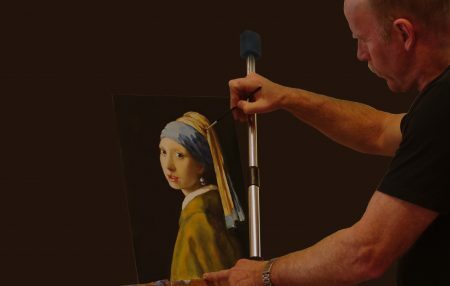 Tuition can be in the technical aspects of using oil paints as a medium or in development of skills in genres such as portraiture or landscapes etc. To enquire about tuition please go to the Contact page. Portrait or general commissions are welcomed. Rates will depend on a number of factors, e.g. size, complexity. But as an indication, a life-size portrait (head and shoulders only) would be around $2000. To request a commission please go to the Contact page.